Why are earthquakes common in Central America? 1 Why are earthquakes common in Central America? 1.1 Where is the Pacific Ring of Fire? 1.3 Is the number of earthquakes in Central America increasing? 1.4 Are earthquakes responsible for the low BPN? Central America is a part of the Pacific Ring of Fire, a horseshoe-shaped area around the edges of the Pacific Ocean, running from Australia to the Andes. Approximately 90 percent of all measured earthquakes on our planet occurs along this seismically active ring. 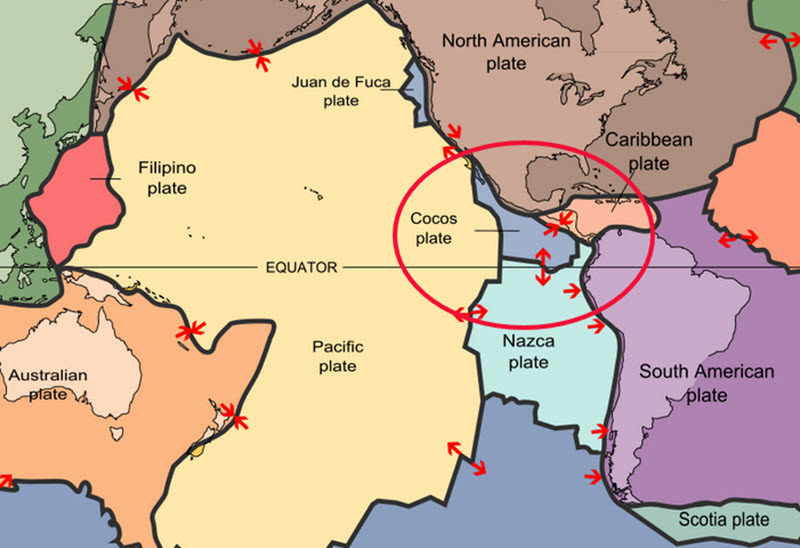 Being a part of the Pacific Ring of Fire is bad enough from an earthquake perspective, but as you can see on the pictures below, Central America is also located where the huge North American Plate meets the big South American Plate, and there is also the much smaller Caribbean Plate, Cocos Plate, and Nazca Plate to deal with. Although it is possible for earthquakes to result from volcanic activity, landslides, mine blasts, and nuclear explosions, a vast majority of all earthquakes on our planet are caused by rupture of geological faults. Central America has a high incidence of earthquakes chiefly because it is located where several tectonic plates meet and assert pressure on each other, resulting in both rupture of geological faults and a high degree of volcanic activity. Where is the Pacific Ring of Fire? 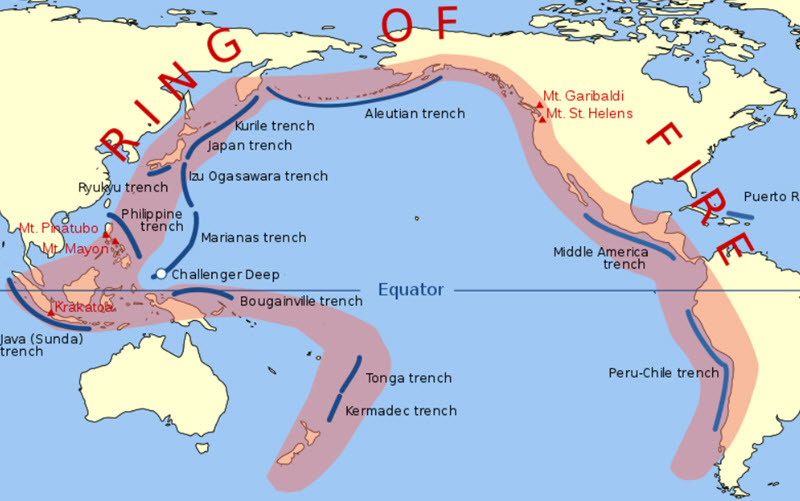 For most of its 40,000 km, the Pacific Ring of Fire bounds the Pacific Plate. In an average year, 90% of the detected earthquakes take place in the Ring of Fire zone, but if we only look at the largest earthquakes, it is “just” 81% of them that takes place here. Earth’s tectonic plates are constantly moving and pushing up against each other, although most of the time we do not notice this. Noticing the motion is especially difficult if you are located far away from the edges of any plates. Scandinavia and the British Isles are for instance located far away from the edge of the Eurasian plate, making large earthquakes virtually unheard of there. The Mediterranean region is on the other hand located right where the Eurasian plate meets the African Plate, making this part of the world much more prone to quakes. Is the number of earthquakes in Central America increasing? An estimated half a million earthquakes occur each year on our planet, but only 20% of them are strong enough to be felt by humans. The other 400,000 or so we know of because we have sensitive measuring equipment that tells us about them. Data from the early 1930s show that there were roughly 350 seismic stations in the world, i.e. stations where earthquakes were detected and measured. Today, there are many thousand seismic stations spread all over the earth – including many in Central America. The number of earthquakes has probably not increased in Central America since the 1930s, but our ability to detect them has, both due to there being more seismic stations than before and because the equipment that we use to detect earthquakes has gotten much better. Are earthquakes responsible for the low BPN? No. the earthquakes is not the primary reason that many countries in Central America are poor. There are other areas that are prone to earthquakes that are a lot richer. Japan is a prime example of this. Poor governments and widespread corruption play a large role in explaining why the area is poor. Poorly developed financial markets and a lack of stock markets also make it hard for business to grow and reach their full potential. Many of the countries do not have any stock market nor any marketplaces for bonds, binary options, CFD:s or other financial instruments. Read more about binary options, CFD:s and other financial instruments here. Another problem that keeps the area poor is the lack of education. The geological situation in Central America is also why there are so many volcanoes here. The Central American Volcanic Arc (CAVA) is a chain of volcanoes dotted parallel to the Pacific coast line of the Central American Isthmus, from Guatemala in the north to Panama in the south. This volcanic arc, which is roughly 1,500 kilometers long, runs through Guatemala, El Salvador, Honduras, Nicaragua, Costa Rica, and northern Panama. The reason why there are so many volcanoes here is the active subduction zone that runs along the Caribbean Plate’s western boundary. There are hundreds of volcanic formations in the CAVA, including stratovolcanoes, lava domes, and cinder cones.